Animal expert Jungle Jack Hanna’s hands-on approach has won him widespread acclaim as Director Emeritus of the Columbus Zoo and Aquarium and The Wilds, conservationist, author, television personality, and lifelong adventurer. Recognized around the country as America’s favorite zookeeper, Jack has made countless television appearances since 1983 on shows such as Good Morning America, The Late Show with David Letterman, Larry King Live, The Late Late Show with James Corden, The View, and Fox News and CNN news programs. 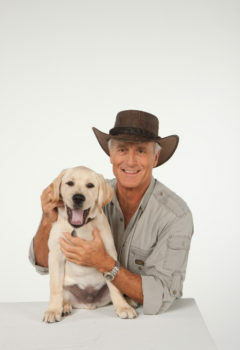 He is the host of TV’s Emmy award winning Jack Hanna’s Into the Wild and Jack Hanna’s Wild Countdown. Jack and his wife, Suzi, lost their beloved dogs, Tasha and Brass, a few years ago – but are lucky that they can spend time with the companion pups that call the Columbus Zoo home.